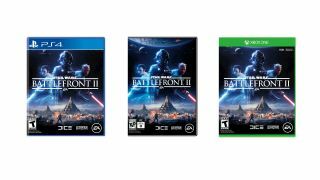 UPDATE: Star Wars Battlefront 2 has gone up to $9.99 at Best Buy, but we've found it for $9.90 on Xbox One a Amazon US. After coming and going from Amazon US at a cheeky $7.99 price tag in the Cyber Monday game deals, Star Wars Battlefront 2 is back for another go at it, this time thanks to the good folks over at Best Buy. That's right, young padawan, DICE's epic multiplayer shooter from last year is 73% off its typical $29.99 going rate, exclusively for Black Friday, available on any platform of your choice. Let me reiterate; that's one of 2017's best shooters for under $8 on PC, PS4, or Xbox One. You'd be mad to pass this up. The price drop is timely since EA just confirmed the new Battle for Geonosis map pack aka a major Clone Wars battle, that is free for all SWBF2 players. You get to play as Obi Wan Kenobi and General Grievous, complete with spinning light sabre(s) attack. Take a look below - you forget how handsome this game is. If you're looking for more Cyber Monday Star Wars deals, check our buying guide to all the offers from a galaxy far, far away, including price slashes on Funko Pops, Blu-Rays, and more. Oh, and Cyber Monday's less than 48 hours from now, too, meaning the deals won't end with the weekend. Truly, the force is with us.